Pinwheel is a Boss in Dark Souls and Dark Souls Remastered. Pinwheel is the boss that lies in the depths of The Catacombs, and arguably the easiest boss in the entire game. You can find his chamber beyond a fog wall, across the valley floor containing blacksmith Vamos at the bottom of the Catacombs that is being patrolled by the Wheel Skeletons. 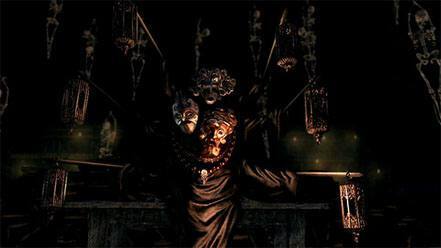 First seen in the official Preview, Pinwheel appears to be a necromancer body of sorts, being controlled by three magically-influenced masks. It awards one of its three masks when killed, and the others may be purchased from Patches in Firelink Shrine, after you've assured him you are no cleric in Tomb of Giants. Once defeated, access to the Tomb of Giants will be granted by way of a ladder in the far corner of Pinwheel's lair. This fireball deals fire damage, obviously, and is his most common attack. After a short charge, he fires a quick fireball dealing decent enough damage to warrant a dodge. When trying to predict what move he's going to hit next, watch his hands. In this case, they glow and spin clockwise to charge the attack. There's a variation on this, where he instead spins his hands counter-clockwise and charges a bigger, slower fireball. This one deals more damage and has a larger hitbox, but is easier to dodge. Either of these attacks can be dodged with a well-timed roll. While initially seeming similar to the previous, this is different as it is a continuous and remaining in its path will do continuous damage. This, coupled with the high damage, can make this attack dangerous if you don't roll out of the way, which is quite easy to do. Pinwheel is able to to vanish, and create as many copies of himself as he pleases; usually occur one after the other. He vanishes when you attack him a few times, and doesn't reappear for a couple seconds. You can tell his disappearance is imminent when he floats in the air, joining all his arms before exploding into thin air. However, he is not completely inconsiderate as he will leave you in the company of a clone. These clones are a carbon copy of him, and the only visual difference, even though slight, is that the copies have a little bit lighter cloth. Clones are limited to quick fireball attacks, and disappear when hit. When he summons a clone, he waves his arms around and summons one through a small purple portal. Pinwheel is generally considered the weakest area boss in the game, although weakness in Dark Souls is relative. Most players will take damage when dropping into his lair before triggering the cinematic, and may have a natural instinct to pause to heal themselves when the fight starts. The drop isn't too painful for a decent level player, and a single Estus should do the trick. With sufficient speed, pressure, and damage output, victory can be obtained very very quickly. Pinwheel generally becomes more dangerous if left alone, as he'll begin cloning himself which makes taking him down harder with fireballs flying in from every direction. While they are pretty easy to block and/or dodge, don't let yourself get surrounded. While targeting the real Pinwheel is the main objective here, don't hesitate from eliminating a clone or two, to your convenience; killing the original will make the copies disappear, so maybe that's worth a shot too. Focusing him will result in an almost instantaneous death. However, during the fight, around half HP, he can spawn around a dozen of these copies at once. A good fire resistant shield, such as the Black Knight Shield or Dragon Crest Shield, can also be helpful to those who need protection from this disappointment of a boss. Pinwheel is a pyromaniac, he is vulnerable to pyromancy, which can be a good strategy choice for any player. Equip your pyromancy spells, and be patient. 8 fireballs from level one pyromancy should take him down to a 1/3 of his health. Combustion, Great Combustion, or an AoE Firestorm-type pyromancy, can also be extremely effective. Similarly, using a fire or a Chaos Weapon in both hands can take down Pinwheel's health very quickly. If you've somehow managed to struggle against the easiest boss in the game, you can summon the help of Paladin Leeroy. While going through the catacombs, it is possible to drop down onto a platform with a summon sign on it, provided you are in Human form. If you drop down from to the same platform where you find the Cleric Set (visit The Catacombs page to find out more), you will find his summon sign. This NPC summon is also quite helpful against the many Wheel Skeletons directly below. As for Pinwheel, just evade and block the attacks, and let the NPC do the job. Paladin Leeroy can beat Pinwheel with 3 hits. A group of Pinwheels can be found with Skeleton Babies later on, before the boss gate of the Tomb of Giants. They have most of the same attacks but cannot summon clones, and have under half the health of the original, making them a relatively easy fight individually; the kicker is that they are all there, and along with the Babies, will attack you simultaneously. The trick here is not to stop moving. Attack one, and kill him, then move onto the next. Ignore the babies, and just target the Pinwheels. You can also farm them for a chance to obtain the two other masks you didn't obtain in your fight against the original. Legit didn&apos;t know he can shoot a fire stream. One time I died to him on NG+. This is obviously a sign that I should never play Dark Souls. If he drops a mask is it automatically added to your inventory or do you have to physically pick up the item? Mm I beat Pinwheel on my first try on PS4, but I died at the same time of killing him. Didn&apos;t get his soul, nor the mask, nor the rite. I&apos;m kinda pissed and I can&apos;t really get them back, can I? :( When I came back to the room he wasn&apos;t there either. Just think, if this boss had a real health pool behind him, he would easily be one of the most fun fights in all of soulsborne. This boss bleeds, but it takes about six hits of Bandit Knife. Did anyone go through the catacombs first on their first playthrough? They should give Pinwheel 3 times as much health and have him just be a lot harder in general in the remaster. For such a cool boss idea it&apos;s sad how easy it is to kill Pinwheel. The boss fight itself is easy as hecking heck, but his story is one of the better ones. I&apos;m kinda dissappointed that we&apos;ll never learn more about him. Dying to Pinwheel is even more embarrassing than dying to Deacons of the Deep. The mask drop is not garunteed.